Denver Savings Bank’s Ambassadors Club will have Don and Dianne Kramer coming to present a program on the Amish people and elements of their lifestyle. The program will be held at 1 PM, Thursday, April 11, in the Community Center in Denver. The Kramers live near three Amish communities, and it has been through their interactions with the Amish and through extensive research that they have been able to gather, organize, and present their findings about these humble, kind, intriguing people. The Kramers will welcome questions and comments about their presentation. Amish treats will be served at the program as well. The program is open to the public to attend. 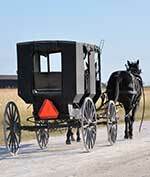 In order to plan for enough Amish treats, an RSVP is requested by calling Denver Savings Bank at 984-5635.